Early Earth's accidental deluge via water-carrying comets has long been a stumbling block for those interested in life on other planets. New research, however, is changing that view. Evidence is mounting that the planet's water arrived early, during formation, aboard meteorites and small bodies called "planetesimals." The work also suggests that though the planet-forming collisions were so energetic that they led to oceans of magma and widespread melting, even the intense heat would not have dried out the planet completely. The emerging view of a watery birth for the Earth has raised the hopes of scientists seeking extrasolar life. If the presence of water isn't left to chance collisions but instead is a product of the planet-forming process, then oceans where life can evolve may be common after all. "It is very possible that many planets are born with liquid water oceans," said Linda Elkins-Tanton, director of the Carnegie Institution for Science's Department of Terrestrial Magnetism. Elkins-Tanton spoke Wednesday at the Geological Lecture Hall. 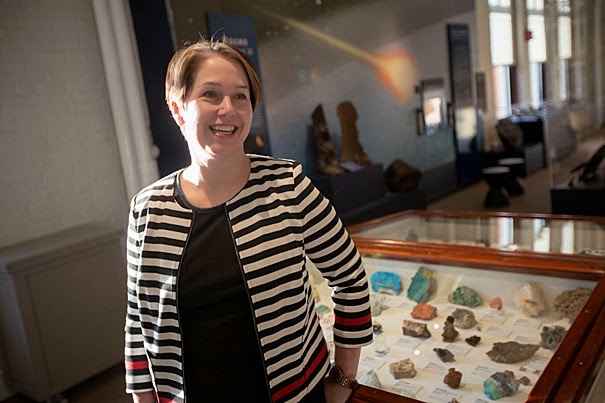 Her talk, "Building Earth-like Planets," was part of the Evolution Matters lecture series of the Harvard Museum of Natural History. Elkins-Tanton studies the evolution of terrestrial planets and the relationship between Earth and its life forms. One problem with the water-from-comets theory, Elkins-Tanton said, is that evidence has emerged that water was present on Earth far earlier than previously thought. The planet's oldest rocks date back 4.03 billion years, but there's a material older than rocks, called "detrital zircons," that formed some 4.40 billion years ago, just 164 million years after the first solids began to form out of the protoplanetary disk. And some of those zircons show evidence of having been created in contact with water. Another issue with the comet theory, Elkins-Tanton said, is that the water on most comets doesn't match that on Earth. Water is made up of oxygen and hydrogen. Hydrogen's nucleus is normally made up of one proton, but the nucleus of a different form, called deuterium, has a proton and a neutron. Scientists can fingerprint water using the ratio of regular hydrogen to deuterium. For most comets, that ratio doesn't match water on Earth, she said. Meanwhile, the water in meteorites and planetesimals does match that of Earth. But before scientists could settle on those bodies as the source of the planet's water, they had to solve another problem. Those bodies had up to 18 percent water, much more than Earth, and scientists couldn't think of a reasonable process to explain where it all went. With the right isotopes in water and roughly the right amount, scientists could point to planetesimals, not comets, as Earth's water source. Next, they had to understand whether and how water might survive the collisions that created the planet. Evidence came from looking at other bodies, such as Mercury and the moon. Scientists examined a volatile material, potassium, on Mercury, thought to be as likely to be lost in an impact as water would be on Earth, and found a ratio similar to that on Earth, indicating that not all volatiles were lost in Mercury's planet-forming process. They also looked at the interior of the moon, which experienced a massive formative collision but no subsequent watery comet impact, and found that parts of it have as much water as Earth does. Together, these examples indicate that water could survive the planet-forming process, Elkins-Tanton said. "The evidence that we have from our solar system indicates that the chances that planets everywhere in the universe are habitable through liquid water obtained by natural accretion … are very high."